New Jersey man critically injured in SUV rollover accident! 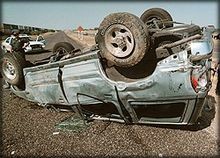 New York SUV Rollover Accident injures 8 teenagers! Long Island firefighters rescue trapped SUV driver off of train tracks!